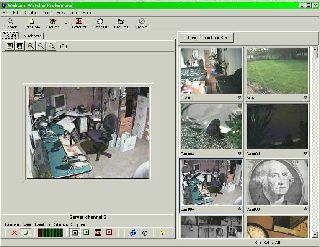 Netcam Watcher Professional:Netcam Watcher Professional is a Digital Video Recorder for Network Cameras that can record from multiple cameras simultaneously. 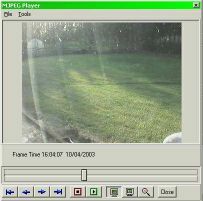 A view of the main screen with one camera currently selected, and smaller thumbnails on the right. 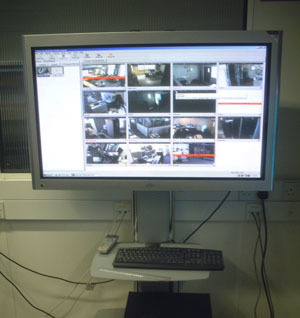 Here it is running on a large plasma display monitoring a series of computer rooms. Notice how the thumbnails on the right can be enlarged up to full size. Click on the Recordings tab and you can see all the recordings that have been made for the current camera, hour by hour. Play any of the recordings by double clicking and the MJPEG player opens. Search through your recordings and see a graphical display of motion. Double click and the MJPEG player opens at the exact point. The CamBar lets you keep some or all of the cameras on screen at all times. You can drag the cambar to any edge of the screen or have it floating anywhere you choose. To put camera on the CamBar, simply drag them from the camera thumbnails. 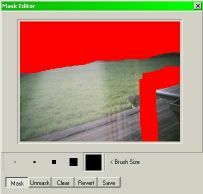 You can mask off parts of the image that you don't want to count for motion detection. Useful for blocking out trees blowing in the wind, people walking past a window, etc. Change the size of the right-hand thumbnails with a single click. The schedule editor lets you create schedules and give them names like "Monitor during the day; motion detect at night". You can then apply these to whichever cameras you choose.Similar to a normal VCR, Netcam Watcher has a Timer button. When this button is pressed down (TIMER ON) then Netcam Watcher operated in automatic mode, running the schedules for cameras and alarms that you have set up. When the button is up (TIMER OFF) the program operates in manual mode.